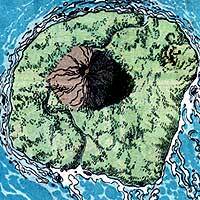 In an attempt to keep their island kingdom safe from the imperialist expansionist tendencies of the United States of America and the Soviet Union, the Chief of KooeyKooeyKooey and his nephew Herb donated their island to the JUSTICE LEAGUE. This proved to be a less than ideal solution to the problem. After a visit to the island where they met the Chief's grandson Puck, BLUE BEETLE II and Booster Gold embezzled funds from the operating budget of the Justice League in order to fund the construction of Club JLI, a resort/casino on the Justice League property KooeyKooeyKooey. Through the malicious intervention of Major Disaster, Big Sir (see INJUSTICE LEAGUE), and the island's own sentience, Club JLI's existence was fleeting but disastrous for the reputation of Booster and Beetle.